Hampstead is or was a village that sits high up on a hill overlooking London to the south. And to the North, which is up the road in my Heath Street painting, you will come across Hampstead Heath. A preserved heath land that remained remarkably unmolested by the developers. Aside that is from Kenwood House which, notably contains one of the best Rembrandt self portraits in existence. 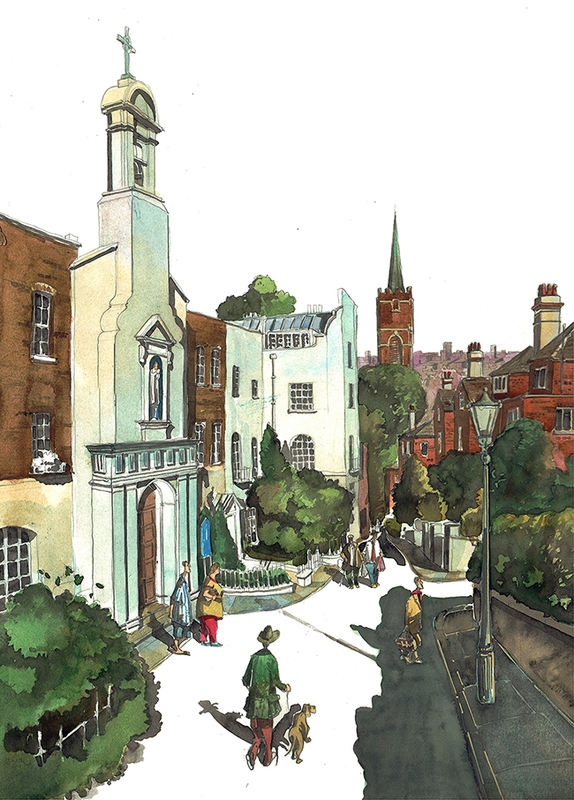 Hampstead as a place was first recorded in the times of King Ethelred the Unready in 896, though its growth really took off in the 1700’s as a spa resort, where it was briefly popular until other London spas took precedence. I suppose no one liked walking up the hill. Hampstead’s next burst of growth came with the railways in the 1860s. Now you could quickly commute into London for work and move out the country at the weekends. The well to do quickly noted the benefits, and some of the most luxurious properties were built in the decades after the railway’s arrival. Once this community was fully established and still growing, the Underground arrived in 1907. 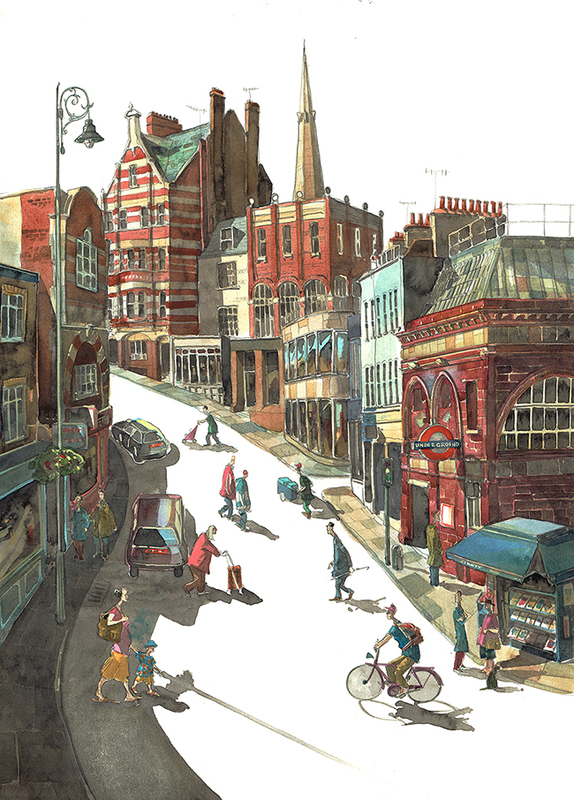 In my painting of Heath Street you can see the Hampstead Northern Line Underground station to the right. This was fine era for Underground and railway architecture. These Northern Line stations were designed by Leslie William Green. He brought in the wonderful ‘oxblood’ tiles and semi circular windows indicative of many of the best Underground stations. Unlike today, they were built at a time when railway architecture wanted to make a unique statement. These stations are very ‘London’. Sadly Green died just a year after the completion of Hampstead Station. I love these stations, and whenever I’m asked to do a London commission I always add an underground station if I can. My second painting is of Holly Walk. Holly Walk is a small almost country lane tucked away off the beaten track from the main streets. I can attest to this being tucked away as I got lost a few times finding it. While I was wandering about, I passed the site of the famous painting: “Roadworks on Heath Street in Hampstead” by Ford Madox Brown. The site is more or less the same as it was in 1865 when it was painted. I know this because I passed it twice whilst lost. At the top of the hill you can look out to the St John-at-Hampstead parish church and the skyline beyond. To the left in my painting you can see another church. This small catholic church was originally a residential house though became a church in 1816. It was set up by French refugees with AbbéJean Jacques Morel (1766-1852) at their head fleeing persecution from the French Revolution and other upheavals. Interestingly, over 100 years later another refugee, General Charles de Gaulle, the future President of France worshipped in this church during the second world war. London often repeats itself. It is a really lovely view and I can see why the client chose it. Thankfully the client was pleased with the paintings too. So was this commisioned by a person or a business? It was commissioned by a person who had lived in there area for sometime. I get a mix of business and personal clients. Gorgeous! Do you do prints of commissions? Namely the first Hampstead painting? I am checking with the client now and will get back to you once i know. 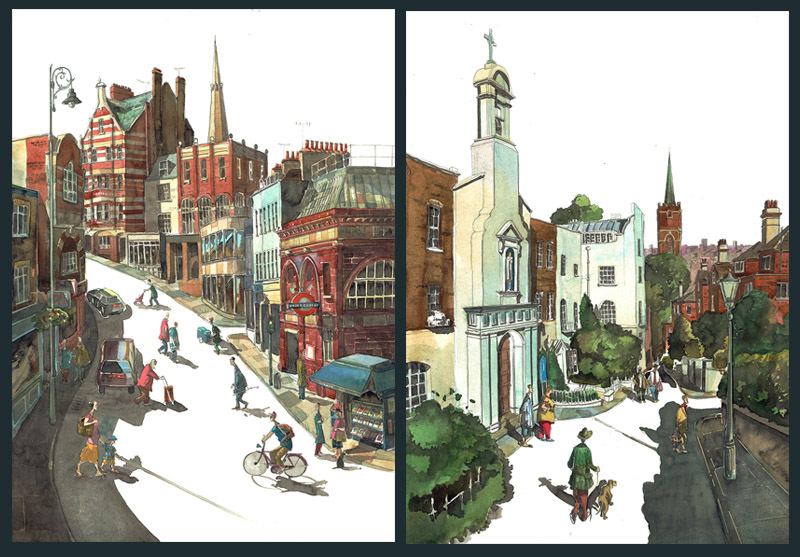 Your Hampstead paintings are magnificent and I really enjoyed reading the blurb around them. Looking forward to the next news letter. Hope you are well and merry Christmas!